The subscription/printing for/of the Journal of Medical Research and Innovation shall be managed/handled by AkiNik Publications, New Delhi, India. The subscription charges will be ₹3000 or $120 per year. payment. Subscriptions are entered on an annual basis and are subject to renewal in subsequent years. H. No. 169, Pocket C-11, Sector-3, Rohini, New Delhi-110085, India. There shall be no charges for the entire 2019 year. Submit your paper soon. Lets make JMRI even better. Cheers to Researchers, Cheers to JMRI !!! After getting many request to start a research group, we have finally started one for all medicos. To read more kindly visit: http://medkrux.com/research-group. Since last few days, we had a technical error and due to which both the sites (jmri.org.in and jmrionline.com) were not working. However, that glitch has been resolved now. We apologise for the inconvenience that caused to our readers. We have changed our domain from www.jmri.org.in to www.jmrionline.com from today onwards. However, the old domain will be still working and re-direct every one on to the new site automatically. Kindly note the changes. JMRI has now been indexed in Index Copernicus with Index Copernicus Value (ICV) as 79.03. The ICV is of 2017 which also was our first year of publication. Congrats to the JMRI team. All articles which are non-open access, shall be made open access post one year of publication. This will boost open access and every one shall be able to read articles for no cost. The editorial board of JMRI welcomes submission of research papers for its next volume. All articles submitted before 31st December, 2018 shall be published for free if accepted post peer-review. We recently became a Crossref member. With that, we now have our own DOI prefix and hence, from now onwards we will use 10.32892 prefix. Our previous DOI prefix was sponsored by Dr. P. V. Phuc and we thank him for his gratitude for sponsoring us up till now. JMRI will now officially display PlumX widgets. We are really glad to say that JMRI will now show PlumX widgets (Plum Prints) in the articles. Thanks to PlumX for allowing us to use their widgets. We believe in Online Metrics, We believe in PlumX. The water level in flood-hit Kerala has started to decline, but rebuilding Kerala could take years. As the rains ease, the focus will be on aiding those whose houses and livelihoods were destroyed, a scale of rebuilding which will require billions of dollars. Indian Independence Day Offer: All articles submitted on 15th August shall be published as open access at no cost if accepted post open peer review. JMRI wishes a very Happy Independence Day to all Indians in advance. Want to submit an article in JMRI? Make sure you have read these important points. 1) Plagiarism: Whether the paper is plagiarised? JMRI shall not allow plagiarism at any cost and from today onwards, we will be banning the corresponding author, in case his/her paper is found to be plagiarised. The authors can self check the plagiarism by using iAuthenticate or Turnitin or Plagiarism checker X. 2) Ethics & Consent: The study should have been approved by the ethical committee of the institution and the patients consent should have been taken prior to submission of the paper. We may ask for the proof during the review. Also, the statements regarding Ethics & Consent should be mentioned in the text, without which we shall not proceed further. 3) Reference format: JMRI only accepts Vancouver style of references. Please make sure you have formated the references as per JMRI's custom style of vancouver. DOI, PubMed ID and direct links should also be added at the end of each reference. More details shall be found out in the Author's guidelines. 4) Conflict of Interest: A statement regarding conflicts for each author should be mentioned in the text. If there is any mistake with regards to the above points, JMRI will not accept the article. Till date, we were lenient about such mistakes, however, we would not accept any such errors from now onwards due to time constraints. As we are trying to upgrade the website and make it GDPR compliant, there may be some glitches in user experience. Kindly bear with us throughout this week. Thank you for your understanding and we apologize for the inconvenience. We have 4 options: 1) Non-open access (Subscription based): NIL/0 USD, 2) Open Access: 99 USD, 3) Individual Fellowship: 199 USD (Publish unlimited open access articles in one year) and 4) Institutional Membership: 999 USD (All authors from the institution can publish open access articles for free). This model of APC will enable every one to publish articles. The authors can decide about the same and let us know, only after the article is accepted which will help in removing the bias. JMRI is pleased to announce its partnership with NHL Medical College, Ahmedabad to publish the top 10-15 abstracts presented in the Adrenaline Conference, 2018. From second volume, second issue: All articles published in JMRI will either be published for free (subscription based-only subscribers will be able to access the full article for free and non-subscriber will be able to buy the article for 5 USD) or for with a fees of 100 USD (Open Access- Any one can get access to the full article without any cost). Authors may select any of the above option after the acceptance of the article. JMRI wins Indian Health Professional Awards in the category - "Best Upcoming Medical Journal". Congrats to the JMRI family. JMRI will now be sponsored by BioMedPress for CrossRef DOI and Cross Mark. BioMedPress (http://www.biomedpress.org/) has accepted to sponsor JMRI for CrossRef DOI and Cross Mark for the year 2017-2018 with no fees. We are really grateful to Dr. Phuc Van Pham for helping us out. With that said, BioMedPress becomes JMRI's official sponsorer and publisher for the year 2017-18. We wish BioMedPress all the success in future and once again thank them for sponsoring us. JMRI team. JMRI is now indexed/abstracted in Semantic Scholar. It will help our articles to reach out through out the world. JMRI wins the November, 2017 contest at ScienceOpen. Post winning the contest, each winner is indexed with ScienceOpen and thus, we will be indexed with them too within a short time after the paper work is completed. Congrats to the JMRI team. The Journal of Medical Research and Innovation has been awarded as the Best Medical Journal (New) of the year 2017 by Indian Health Professional Awards (Healthcare Oscars of India). Dr. Varshil Mehta (Editor in Chief) will be collecting the award on the team‘s behalf from Mr. Milkha Singh in the awards ceremony event which will be held on 23rd December, 2017 in New Delhi. JMRI congratulates Miss (and to be a doctor) Manushi Chhillar on winning the Miss World, 2017 title. The entire team of the Journal of Medical Research and Innovation, would like to congratulate Miss Manushi Chhillar (a second year medical student from Bhagat Phool Singh Government Medical College for Women in Sonipat) on winning the Miss World, 2017 title. A proud moment for India. To provide an open platform and show 100% transparency, we will now show the peer reviews and author’s reply to the reviews of the articles published henceforth. JMRI is #transparent #quality #trulyopenaccess. We are pleased to announce the beginning of our new section "An Interview with the corresponding author". From today onwards, each article will have a "Interview" section, which will have the interview in writing with the corresponding authors. This is happening for the first time in the world. Before we used to have podcast, but not written interviews for every article published. Ever thought to have a Journal in which you can publish articles for free? Where you don't need to wait for months to publish? Where your articles are well read and referred? Where peers actually help you to improve and publish articles rather rejecting the articles for insignificant reasons? JMRI now invites you all to partner with us and publish articles from your hospital or medical college for free and in a stipulated time of 3 weeks (if accepted post peer reviewed). Contact us on editor@jmri.org.in and start showcasing your research today. Reviewed for JMRI? Get the credits you deserve through Publons. JMRI has partnered with Publons for the benefits of our reviewers. FAQs for reviewers on how totake advantage by reviewing for JMRI. Visit JMRI's Publon Page to register/add your review credits. 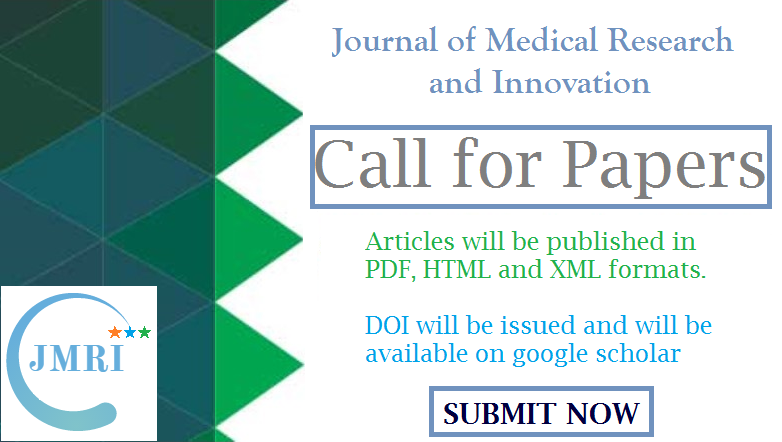 The Journal of Medical Research and Innovation invites the physicians to submit their articles for the Second volume, Issue 1 of JMRI which shall be published in January, 2018. JMRI is pleased to inform that it has now partnered with Publons and TrendMD. Publons will give an opportunity to all of our reviewers to maintain a reviewer's profile and TrendMD will help us to spread our articles across the websites of the leading publishers like BMJ, Elsevier, Nature etc. For more info, kindly visit their respective websites (Publons and TrendMD). JMRI is now indexed/registered in Index Copernicus, CNKI Scholar, Journal Factor, Researchgate, BASE and Google Scholar. Thank you for supporting us. JMRI will be publishing two issues (Bi-Annually), first in January and second in July respectively, from the year 2018 onwards. However, as soon as the article is accepted, it will be published as online first (Article in Press) which can be cited using the DOI. Thank you for supporting us. JMRI will now be acknowledging the Editors in every issue along with the Reviewers. I am delighted to share the news that the Journal of Medical Research and Innovation has now been assigned with a ISSN number. Now the Journal is officially registered with the Indian ISSN center and hence, International ISSN Center. As per the policy of JMRI, we would re-shuffle the Editorial Board by adding new members and terminating the contracts of old members based on perfomance from 1st June, 2017. Re-Shuffling is done routinely every 6 months for the benefit of the academic world. The EB is not only for name sake and we are only keen to keep the active members. Hence, we are giving one month time for the members to email us and show their support for JMRI. The termination shall be made otherwise without any further communication. The editors can however, ask for certificate for being a part of EB of JMRI. Hoping to see every one's support. Journal of Medical Research and Innovation. JMRI launches Best Article Award 2017. One best each Original Article, Review Article and Case Report will be selected based on readership and citations received. The corresponding author of these articles will be honoured with a certificate and Indian Rupees 1,500. JMRI unveils its new logo and new nick name. From 28th January, this logo shall replace the old one. Greetings from the Journal of Medical Research and Innovation (www.jmri.org.in). We invite you to submit your research to JMRI. The JMRI is a multidisciplinary peer-reviewed E and Print journal published every once a year.